* Take out only—The special includes any style pizza with up to 3 toppings and a growler of any Piece beer currently being offered in growlers. A new growler will be provided with every purchase of the Sunday special. No need to bring in the old one! Please call in, this offer isn't available through online ordering. Piece unites classic New Haven-style thin crust pizza with award-winning microbrews in a spacious loft setting. We opened in July 2001 after transforming a roofing company garage into a casual pizzeria complete with a skylight ceiling and sunken lounge area. Sports fans can catch their favorite games. Revelers pack the house for games and special events. 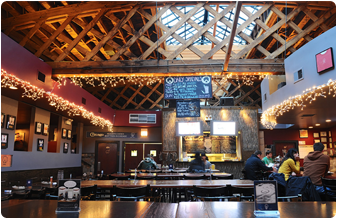 Brewer Jonathan Cutler has won 28 medals at the World Beer Cup and Great American Beer Festival, making Piece Chicago's most award-winning brewpub. In 2006 Piece and Jonathan won the prestigious World Beer Cup Champion Small Brewpub and Brewmaster Award. Be sure to stop by and try one of our award winning brews. Reservations may be made on the main floor for parties of 10 or more Monday through Thursday, and for 20 or more Friday through Sunday. Please note that the group reservation deadline on Friday nights is 6:30pm, and the deadline for Saturday nights is 6pm. Request a reservation. Reservations for the Pit and Stage are subject to management discretion, and are generally determined based on availability and musical performances. All Availability and times are subject to change due to holidays, sporting or special events. Please note that we do not accept call ahead seating.